I saw this fun little project in Home Depot's flyer this week and thought how easy this would be to do for a weekend project. 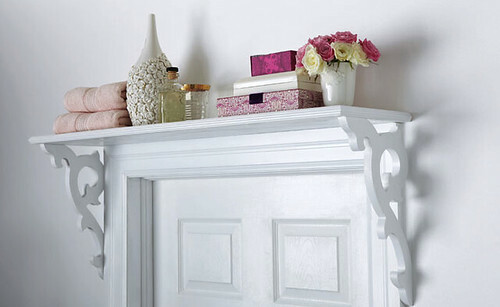 Make this shelf for above the doorway in the kitchen or bathroom (or wherever). A fun little way to create some cosy storage. Click here to read how. Might want to check out this blog. 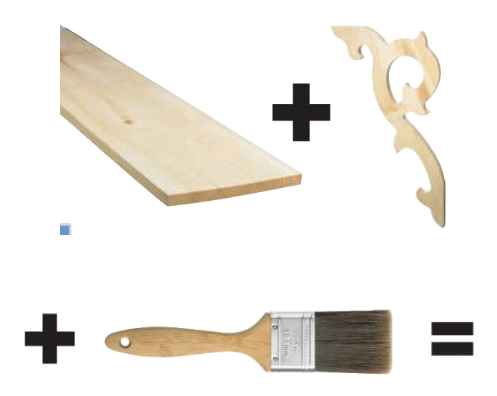 She is doing a DIY Friday blog and this might just be it. Wow! it's beautiful :) I'll try to make this one. I love it! what a great idea especially since i need shelves! I love this idea! It seems very Scandinavian country (a la Carl Larson). This is perfect for a bathroom or a room with a lot of little knick nacks. It looks great! That looks like something even I could do, Jan! thanks for sharing. I love it! Perfect idea for that boring door I'm looking at right now. I am sending this idea to my daughter...its a great idea and really dresses up a room while providing a little more display space....Thanks! Nancy. such a great idea - and it adds height to any room! Cute! Definitely going to give this a go sometime. This is such a great idea and perfect idea for my sewing room. Thanks for sharing! This is really a great idea! I never have enough display space. Thank you. I would have never thought of this but it looks amazing!! What a brilliant idea! I love this! I have been stalking your blog for quite some time now but have finally commented! Love all of your handmade picks! This is really a really sharp over the door shelf. Love it. Gives the room some interest and has a bit of storage. More than ever, I love the idea of having a door below my shelf. Makes me feel really high up :) or so I would think, since I don't actually have this. Thanks for sharing! Hi...The links are no longer available...do you have the instructions and list of materials by any chance.